Coenzyme Q10 or ubiquinone is an essential element for the proper functioning of the mitochondria, the powerhouses of the body. 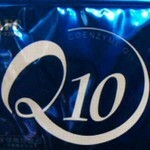 Favoring the production of ATP in the presence of oxygen, coenzyme Q10 is essential to maintain a good physical efficiency; therefore is not a case that it is togethers in every cell of the organism (it is said that has distribution ubiquitiaria), from which the term ubiquinone (vitamin Q). Summarizing, we can say that coenzyme Q10 plays a key action in the production of energy, so much so that without his intervention, the body can not function properly. Coenzyme Q10 is recognized as an essential element for the health of all those tissues where it is greater than the cons u mer of energy, such as the heart, the vascular system and the nervous system. E 'useful for the exercise because it is an important cofactor in the production of cellular energy, improves strength, aerobic capacity and reduces body fat. The coenzyme Q10 is particularly concentrated at the cardiac level, where they consume mainly gr axes for energy and are necessary for this mitochondria numerous and large. From qu the hypothesis that dietary supplementation of coenzyme Q 10 may be useful in the presence of ischemic heart disease mic. Under these conditions, higher levels of Q10 may improve the efficiency of the electron transport chain, increasing the energy available for the cardiac activity and relieving the symptoms of the disease. Furthermore coenzyme Q10 has an important antioxidant action and protects cellular structures against free radicals, in particular acts as fat-soluble antioxidant in the skin, against peroxides which damage the collagen and elastin, and thus against the loss of elasticity and the formation of wrinkles. The concentration of coenzyme Q10 tends to decrease with aging; low levels are also recorded in the presence of particular chronic diseases, such as those arising from cardiac problems, Parkinson's, muscular dystrophy, diabetes, cancer and AIDS. Some medications, such as statins used in the management of hypercholesterolemia, can lower the levels of Coenzyme Q10. The decline in physiological or pathological condition of coenzyme Q 10 you can counter with proper nutrition and specific supplements. It 'found in many foods such as eggs, bran, rice, wheat germ, fatty fish, meat and peanuts, but its absorption from food is influenced by the digestive process, which is why it is often appropriate to use integration. An innovative and effective response to the difficult absorbability if diassunzione through diet or supplements in tablet form, is given by coenzyme Q10 liquid to drink. The coenzyme Q10 in this case is transported directly within the body without the need for transformations gastric that limit its absorption. - It was discovered in the United States in 1957 at the University of Wisconsin by Professor Crane in the mitochondria of beef heart. - Professor Peter Mitchell received the Nobel Prize in 1978 for his discovery of the functions of coenzyme Q 10. - Hundreds of scientific papers have demonstrated the efficacy and safety of coenzyme Q10. - Coenzyme Q10 has also been used in cancer with brilliant results in muscular dystrophy, angina pectoris.